Although Sun Yat-Sen became provisional president of the republic of China on December 29, 1911, his government lacked sufficient authority to sustain itself. 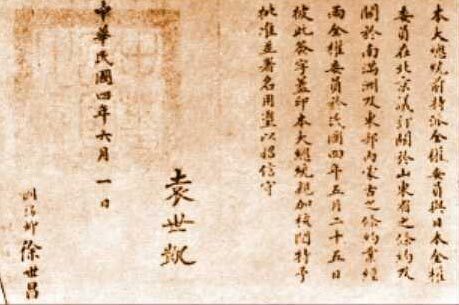 Much of China was run by military governors and gentry leaders, who owed nothing to the government founded by Sun in Nanjing. Sun’s secretary, Hu Hanmin, recalled that the ministries ‘existed only in name’, while expenditure outweighed revenue.­ Soon after the abdication of Emperor Pu Yi, Sun announced that he would hand over the presidency to Yuan, doing so on April 1, 1912, and instead taking up the post of Minister for Railways. Even in this role, Sun remained somewhat inefficient, setting the unrealistic goal of building a railway as a straight line across all of China without taking terrain into account. Yuan came into government facing a difficult economic situation – China was in a large amount of debt, running a trade deficit, and plagued by inefficient tax collection and corruption, which resulted in tax revenues running at a third of what they should have been. Furthermore, Yuan’s regime rested on the strength of his armies and their ability to defeat competing warlords, which meant that military expenditure ran high. Despite this, the Chinese economy grew during Yuan’s rule. The currency doubled against the US dollar, the trade deficit fell and new local enterprises pushed annual growth to 13.8%. However, this economic activity was driven primarily by independent businessmen who operated outside Yuan’s sphere of control. Yuan, meanwhile, attempted to fix the economic situation through foreign loans, marking his return to the methods of the Qing regime. More than 40 million pounds were raised on railway projects. On April 27, 1913, his government secretly signed a contract for a 10 million pound loan from a 6-nation consortium, whose high interest rate meant that, if repaid in full, it would have cost the country 43 million over 47 years. 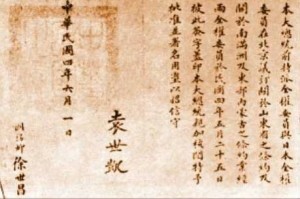 As part of the loan terms, Europeans were appointed to oversee the collection of salt taxes and head a new Audit Office, to which government departments had to apply for authorisation of expenditure, effectively meaning that China’s government had succumbed to the financial control of foreigners1. control of Shandong, Manchuria and Fujian, allowing Japanese advisors to occupy key positions in the administration, police departments being run jointly with Japanese police and Japan becoming the sole arms supplier to China. China was to effectively become a protectorate (district) of Japan. Yuan refused the administrative demands, but accepted the economic conditions on May 7. He confirmed Japan’s recent seizure of German ports in Shandong proince, extended Japanese rights in Manchuria and Inner Mongolia, and barred China from giving any further concessions to foreign powers except Japan. In response, protests broke out in major cities, with May 7 being branded the ‘Day of Shame’ – 19 generals declared their readiness to fight for China’s sovereignty, but Yuan did nothing. forcibly escorted out of parliament – without the KMT members, the parliament lacked a quorum (the number of representatives needed for a valid session to be held) and therefore could not continue to operate2. Yuan dealt a further blow to democracy on February 28, 1914, when he ordered the dissolution of provincial assemblies. By May 1, 1914, a new constitution was put in place, which expanded the powers of the president, allowing him to declare war, sign treaties and appoint officials without the approval of parliament. China’s reversion to imperial rule was complete when Yuan officially declared himself Emperor on January 1, 1916. The revolution had come full circle. As a result of his policies, Yuan faced dissatisfaction from various sections of Chinese society. The use of repression and establishment of a dictatorship lost him the support of constitutionalists and republicans such as Sun Yat-Sen, other intellectuals and students became hostile, and the gentry resented his pretentious claims to Imperial authority. In 1913 this opposition amounted to a full-blown attempt at insurrection, when in the period of one month 7 southern provinces declared independence from Yuan’s China. In one of these, Guandong, the progressive provincial assembly made a start on land reform and ambitious programs for education, sanitation and health care. In response to the challenge this so-called Second Revolution posed to his authority, Yuan sent down a 4000-strong force to overthrow the rebel governments in the south. The local assemblies were dissolved, newspapers shut down, and Confucianism, along with the obedience it implied, was extolled. However, by 1916 Yuan was facing a more significant military threat, when an army from the south-west province of Yunnan marched on him, with other southern provinces joining in and northern generals offering only token resistance. Unable to counter this military threat, on March 22, 1916 Yuan gave up the throne.